For the Indian team, some of the issues that need to be addressed are Shikhar Dhawan’s form, Dhoni’s batting position and how to get the balance right till all-rounder Hardik Pandya comes back from suspension. Left-handed Dhawan’s position at the top of the order is under no imminent threat but the highest score of 35 in the last nine games doesn’t make a pretty picture. That Rishabh Pant has been instructed by the team management to face the new ball against England Lions in a home series is an indicator that they are trying to get back-up options ready. Dhoni did well as a No.4 in the final ODI against Australia but Kohli is likely to use him more as a floater depending on match situations. With the Napier ODI promising to be a high-scoring affair as per New Zealand coach David Stead, a Dinesh Karthik or Kedar Jadhav could be promoted up the order. In the bowling department, Bhuvneshwar Kumar and Mohammed Shami will expect a bit more support in case the skipper plays a young third seamer in either Mohammed Siraj or Khaleel Ahmed. 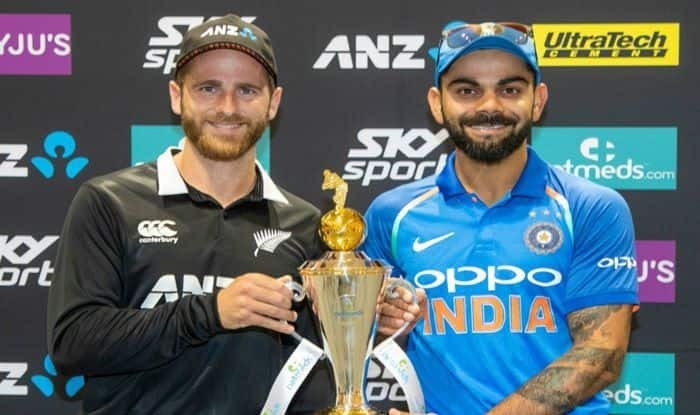 The New Zealand top-order also has a formidable look with one of the world’s best batsmen in skipper Kane Williamson and the ever-dangerous Ross Taylor, who is second only to Kohli in terms of batting averages (92) in 2018, holding forte. The 1st ODI between India and New Zealand will begin at 7:30 AM IST. India: Virat Kohli (C), Rohit Sharma, Shikhar Dhawan, Mahendra Singh Dhoni (wk), Kedar Jadhav, Dinesh Karthik, Vijay Shankar, Shubman Gill, Yuzvendra Chahal, Kuldeep Yadav, Mohammed Shami, Bhuvneshwar Kumar, Mohammed Siraj, Khaleel Ahmed, Ravindra Jadeja. New Zealand: Kane Williamson (C), Ross Taylor, Tom Latham, Martin Guptill, Colin de Grandhomme, Trent Boult, Henry Nicholls, Doug Bracewell, Lockie Ferguson, Matt Henry, Colin Munro, Ish Sodhi, Micthell Santner, Tim Southee. Here are some top picks for your fantasy teams ahead of the New Zealand vs India first ODI: MS Dhoni, Virat Kohli, Yuzvendra Chahal, Ross Taylor, Lockie Ferguson.